The chozhas used to maintain armies in several places in their country to protect their kingdom. One sucj group was called Ambalakarar and who were stationed in Vellalur Nadu near Sivagangai and their job was to protect the kingdom from the sea robbers . The chiefs of these castes were eleven in number and they were called “Karaikararkal” ,The Ezhai Katha Amman (Goddess who protected the poor) belonged to this caste. In Vellalur aboyut 900 years ago lived two sisters. The elder one though married did not have any children. The younger sister had about 8 children. The elder sister loved these children, and fondled all of them. The younger sister became jealous because of that. Other people told her that all her children will desert her and go with her elder sister. One day , when the elder sister came in search of the kids, the younger sister locked all her kids in the Chicken cage and told her sister that they were not there. The elder sister who happened to see the children in the cage , then said, “If they are not there, then they would not be there..” After she went back the younger sister found that all her kids had turned in to stone. When her neibhbours saw this they advised the younger sister to go and approach the elder sister. The kind hearted elder sister then brought back to life all the kids. This elder sister was well known for helping poor people. After her death, her clan members started worshipping her as Goddess. 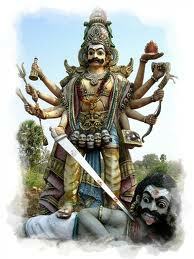 The festival of her temple starts on the last Tuesday of Avani or first Tuesday of Purattasi. And would continue for fifteen days.. Seven small girls are selected ion the first day of the festival and have to live in the temple for fifteen days.. On the fifteenth day these children carry pots of milk to the goddess on the fifteenth day. People believe that praying this Goddess for anything connected with children would be answered positively. People believe that prayers done on Tuesdays and Fridays are more effective.. This temple is ten km away on the Melur Sivagangai road., On Tuesdays and Fridays temple would be open from 9 am to 2 Pm. Agaram Serathamman of the herb garden.